The biggest single item needed for making fishing lures is a work bench, table, or desk. Fortunate, indeed, is the man who has a basement, den, or special room where he can have a permanent work bench and various power tools to pursue his hobbies. For many this is out of the question, and they have to do their work on a kitchen table or desk which must also serve for other uses. This tends to discourage many who are irked by the chore of taking out and putting away tools and materials every time they want to work on fishing lures. If you have no permanent work bench the best solution is to keep your tools and lure-making materials in a chest, cabinet, or drawer where they are available quickly. 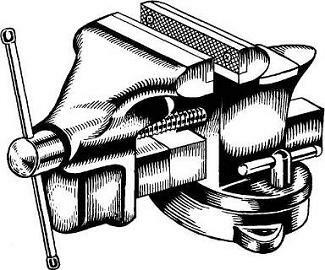 After you have such a bench, table, or desk you need a vise (see illustration below) which will hold the various lures for drilling, filing, bending, and other operations. Almost any bench vise of good size will serve the purpose. Unless you have a permanent work bench, this vise doesn't have to be fastened to the table or desk until needed. A small anvil is also useful if you plan to make many metal lures or parts for such lures. It is used for cutting, bending, punching, and riveting. However, if you get a big bench vise of the machinist's or utility type you can use the anvil surface found on such vises. Or you can use a small block of iron with a smooth surface as a makeshift anvil.